This is what dinner looked like before Grubbie Guard. You can even see one of the dogs standing by the base of his chair waiting for something to drop. 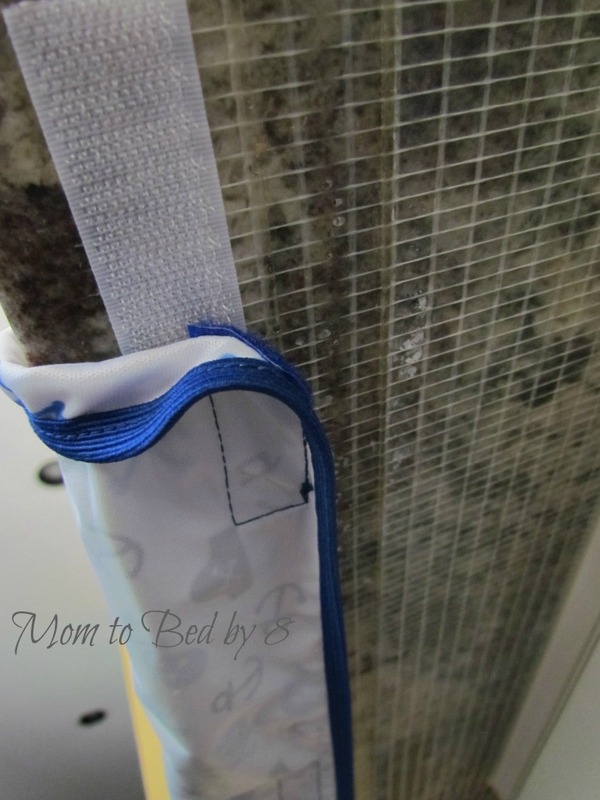 I was constantly on standby with wet paper towels ready to catch the drips and drabs before they reached Hunter’s clothes, and would feel defeated and anxious when I missed one and it permanently stained yet another piece of clothing. I saw this product and could not WAIT to try it. When we received the Grubbie Guard the packaging was simple and easy to open, with the product displayed well. (We love the pirate design!) You can see the quality of the product through the clear packaging, from the stitching to the bold colors of the print. I thought about how much of my son’s food really ends up on the floor (and in our home it is not wasted, but for those homes without dogs to clean up the scraps) I can’t imagine putting a value on how much waste happens every day! 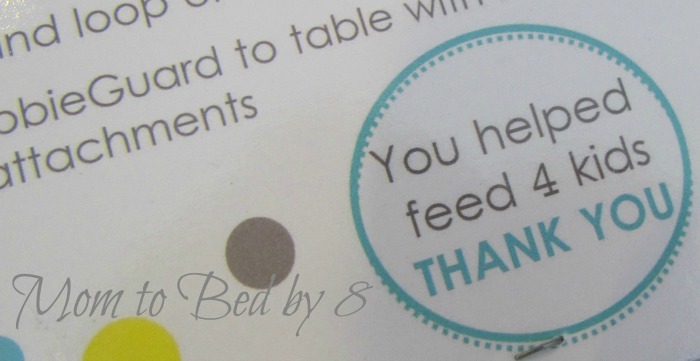 The Grubbie Guard is easy to “install” at the table. It comes with a strip of Velcro and you simply clean and dry the underside of the table, remove the backing, and press the sticky side of the Velcro strip on the underside of your table. I was a bit skeptical of the Velcro at first (we all know how the hooks love to catch on anything they are not supposed to!) But the makers of Grubbie Guard already thought of this, so the soft side of the Velcro is sewn into the Grubbie Guard, and the catchy side is what sticks under the table. 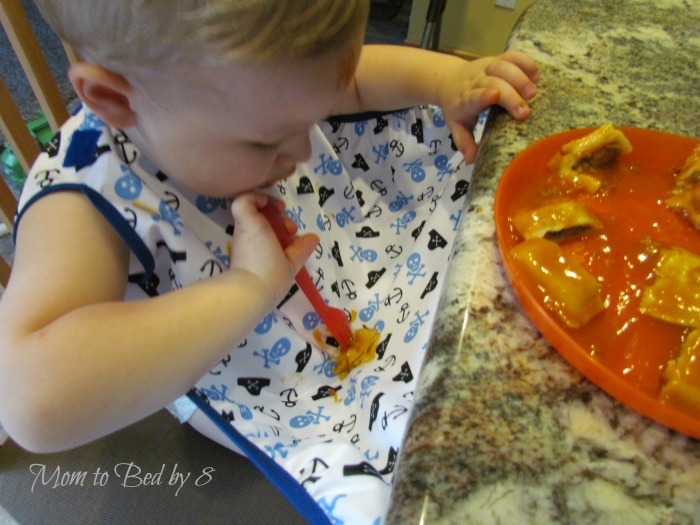 The quality of the Grubbie Guard it much better than any bib we have tried. 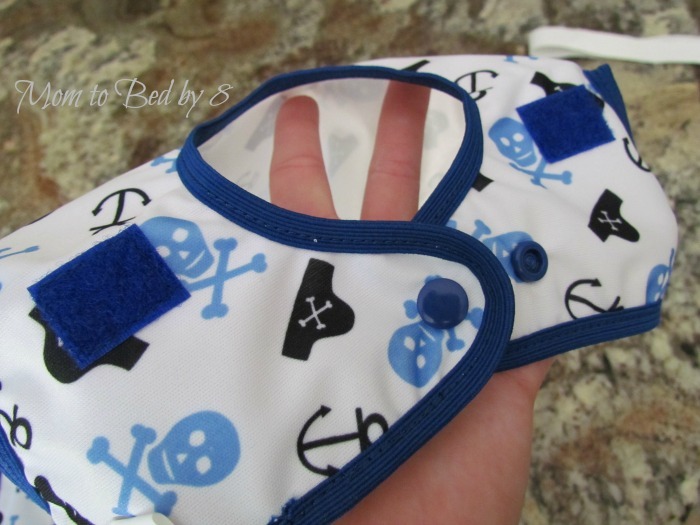 The material is soft and stretchy, the snap closures are sturdy, and the stitching around the elastic edges and Velcro are precise and of superior quality to any other bibs I can recall. 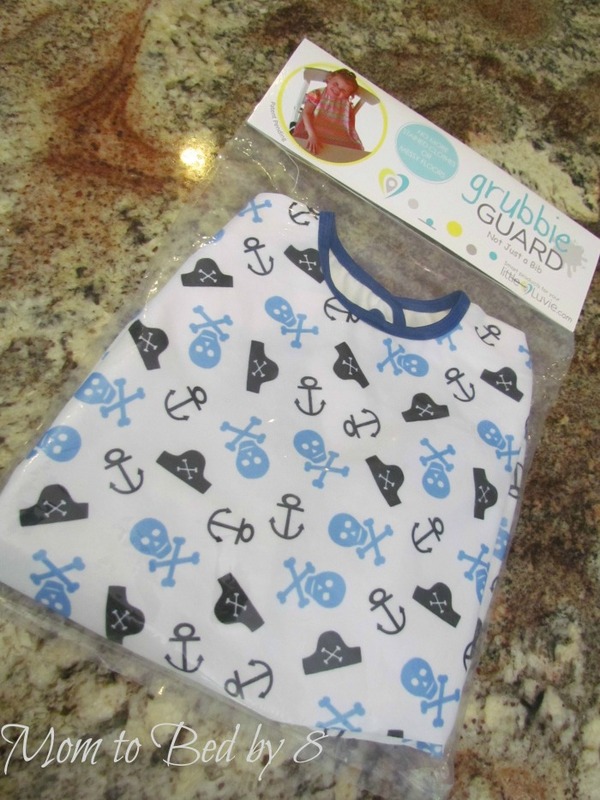 Now it’s time to test out the Grubbie Guard on a squirmy toddler! After sliding his arms through the Grubbie Guard just like a t-shirt, and buttoning the widest button on the back of his neck, it took a quick stretch to connect the Grubbie Guard to the table and we were ready to rock and roll. 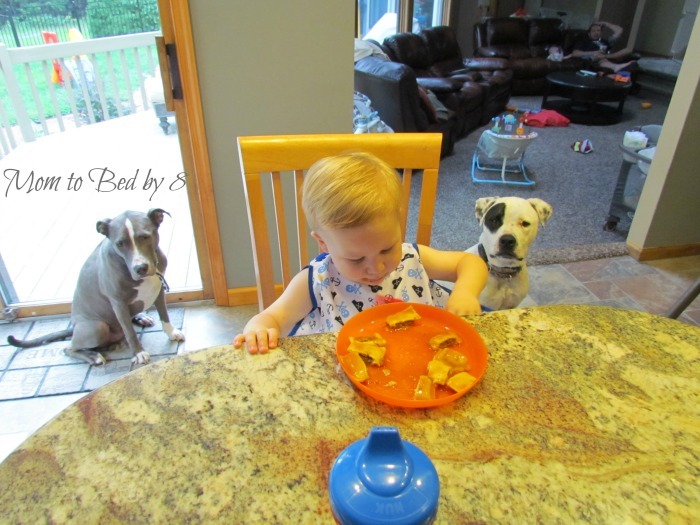 Now Hunter is ready to eat and the dogs are starting to assume their positions around his seat. 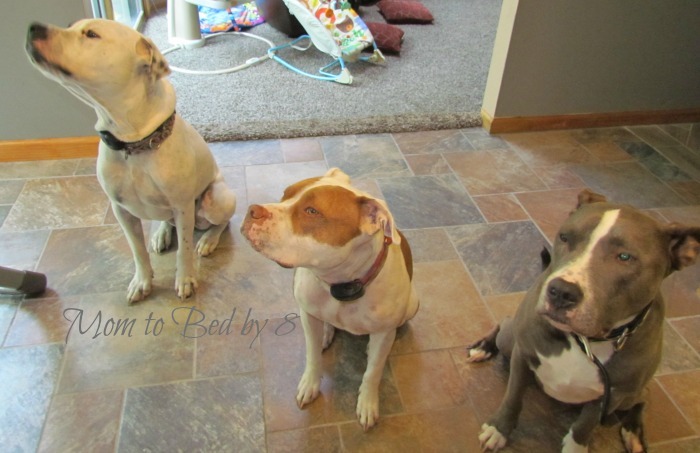 After a few bites, they have moved to the begging position, hoping that if he sees them, he may toss some food their way. 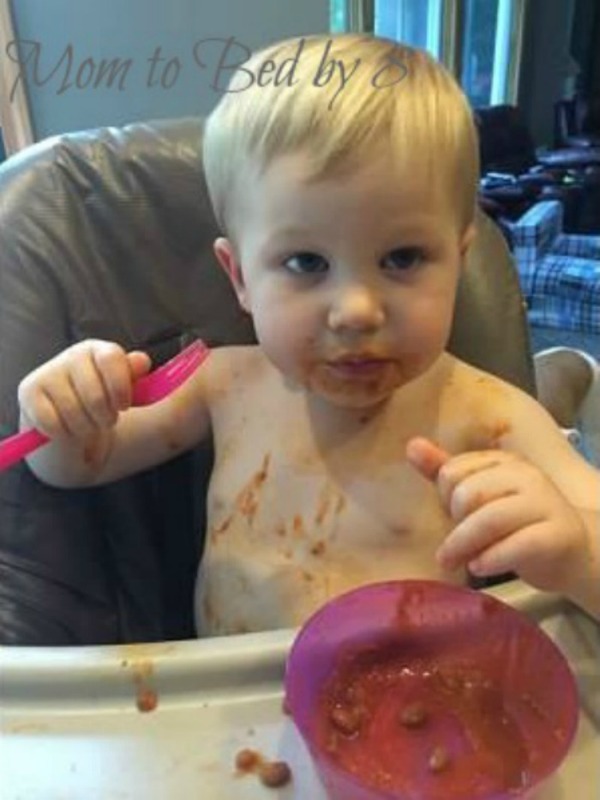 It doesn’t take long for the first drop of ravioli. Hunter quickly realizes he can actually pick it right back up with his fork, instead of it dropping on his lap and then the floor, causing the dogs to come running. Now he is thoroughly enjoying his meal, and I don’t have to worry about catching those drips before they hit his clothes. It always happens when I turn my back for one second, either to put a dish in the dishwasher, or to grab the baby from his swing. It never fails. I can feel my anxiety levels coming down! 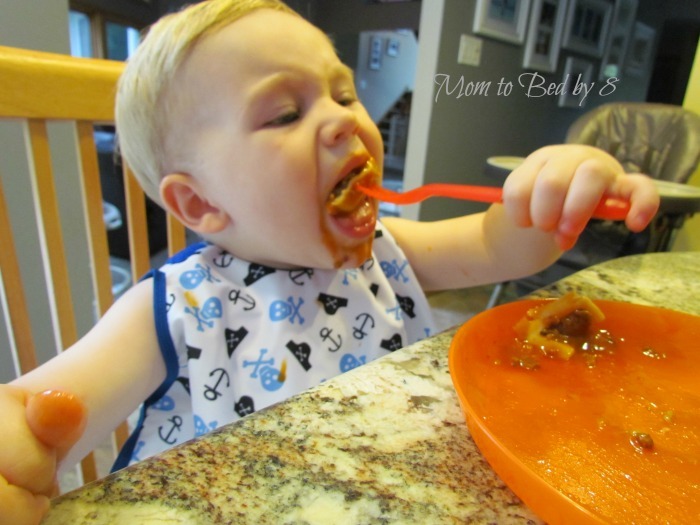 And then the moment which surely would have made me gasp before… Hunter knocks the entire plate over the edge… but no worries, because unlike a traditional bib, the Grubbie Guard caught the plate before it could hit his lap, let alone the floor! Even Hunter has a look of surprise as he is able to catch the plate and put it back up on the table himself! The dogs, however… not so thrilled with the efficiency of the Grubbie Guard. 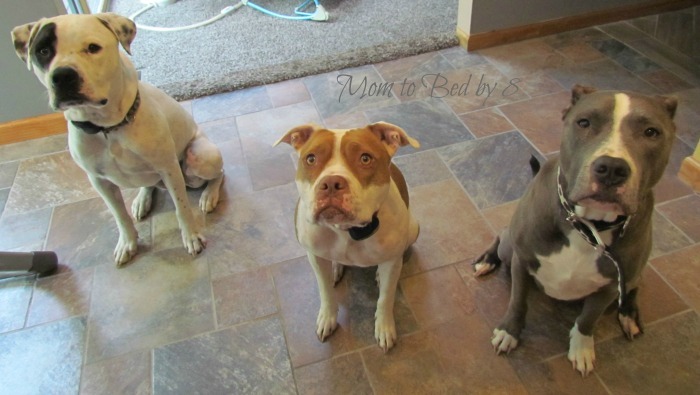 “Mom, there really are no scraps for us tonight? ?” I guess a regular dog treat will just have to suffice tonight! The Grubbie Guard exceeded all of my expectations. The quality of the product is fantastic, the ability to machine wash and not have to worry about the Velcro catching on items in the wash is a bonus. 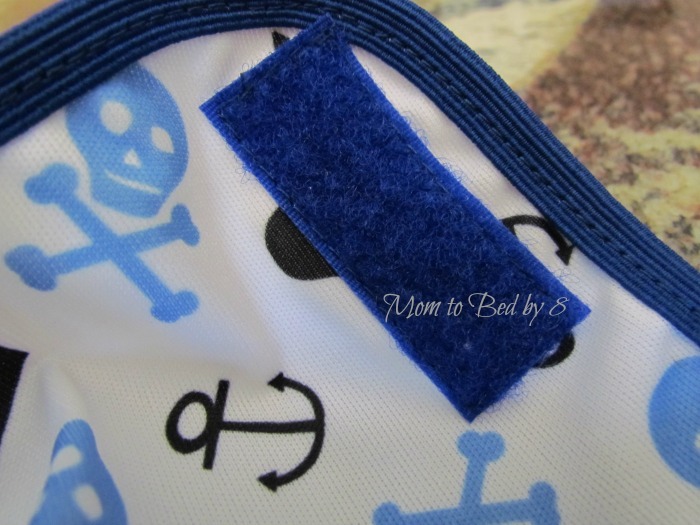 Not having to fish crumbs and messes out of the “pockets” of some bibs I have tried in the past is a huge benefit for me as well. 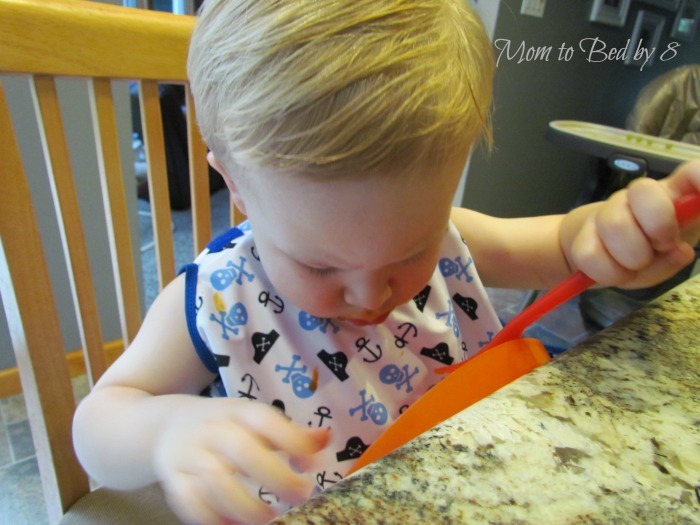 I can’t wait to use this product when my four month old starts solids! One winner will receive a Grubbie Guard (of choice). Giveaway ends August 25th at 11:59pm, open to US residents, ages 18+. Only one entrant per household, per address. Winner is subject to eligibility verification. Enter using the giveaway form below. I'm Tara, a married, full-time working mother of two boys under two, and three furry "kids" that make our family whole. Life as a full time working mom trying to balance married life, parenting, three dogs, and some "me" time along the way is chaotic, but worth every moment. I hope you will enjoy some of our adventures along the way!